A veneer is a thin layer of restorative material placed over a tooth surface, either to improve the aesthetics of a tooth, or to protect a damaged tooth surface. 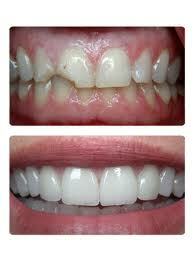 They are an ideal choice for improving your smile. There are two main types of material used to fabricate a veneer, composite and dental porcelain. A composite veneer may be directly placed (built-up in the mouth), or indirectly fabricated by a dental technician in a dental laboratory, and later bonded to the tooth, typically using a resin cement such as Panavia. In contrast, a porcelain veneer may only be indirectly fabricated. It can use one veneer to restore a single tooth that may have been fractured or discolored, or multiple teeth to create a “Hollywood” type of makeover. With Veneers as an alternative, there is no reason to put up with gaps between your teeth, teeth that are deeply stained, badly shaped teeth or teeth with old bonding already on them. A veneer placed on top of your teeth can correct these maladies, usually within three appointments. You should also know that this is usually an irreversible process, because it is necessary to remove a small amount of enamel from your teeth to accommodate the shell. Your dentist may also recommend that you avoid some foods and beverages that may stain or discolor your veneers. Sometimes a veneer might chip or fracture. For patients with mildly discolored tooth we first recommend teeth whitening because it is the least invasive cosmetic dentistry option. Veneers are not the ideal treatment for crooked teeth, and from the point of view of preserving your natural teeth structure, orthodontics would probably a better solution. For teeth that are not severely crooked, veneers placed over their front surface will give a straight and perfectly aligned-looking smile. Even the most innovative whitening techniques or conventional prostheses (e.g., metal-ceramic crowns) cannot achieve the perfect white teeth, what the celebrities having. Demi Moore, Catherine Zeta - Jones and even Victoria Beckham has beautiful smile by a porcelain shell. Spectacular transformations from the world of celebrities! Check out the before and after pictures, click here!